I want to think that the beauty and joy of cooking starts with a good cookware. It motivates one to cook and play with innovative cooking ware. Although my main role in the kitchen is a food taster, I appreciate fancy cookware and utensils. I remember when I invested on colored ramekins and baking supplies when I started learning how to bake. Most of them just temporarily hold the flour, sugar and baking soda, but they add to the excitement of baking even a simple recipe. Lock & Lock, with its iconic airtight containers that provide ease in storing and transporting food, launches its own cookware and glassware lines. My mom and I can personally testify how durable Lock & Lock products are; but a road test for the new Lock & Lock Glass Line and Lock & Lock CookPlus might be fun and exciting too. How about a cooking challenge? Oh, yes, I did participate! Lock & Lock was launched in 1999 and it revolutionized the food storage by introducing the concept of air tight and liquid tight containers. Since its global launch, Lock & Lock has acquired 1022 patents, trademarks, and registrations of design in 68 countries. The addition of the new CookPlus and Glass Line is just exciting! Click Read More for more stories about the Cooking Challenge! The Lock & Lock Glass Line is made with borosilicate glass which makes the product durable and able to withstand varying temperatures. Take example, heating a food in a microwave straight from the freezer. With the new Lock & Lock Glass Line, there is no need to transfer containers. In case the glass is broken, it would not shatter into tiny pieces but probably be broken in 3 pieces only - which would prevent accidents and injury. My mom and I have seen this new line of cookware from Lock & Lock but we stayed loyal with the "S" brand that we use at home. I was ecstatic to got invited for the launch, and even got to cook using this new line. What makes CookPlus extra special? CookPlus items are perfluorooctanoic acid (PFOA) free, which is man-made chemical that causes developmental and adverse effects. CookPlus are made from quality ceramic which better insulates heat, cutting the cooking time into half. CookPlus is made with ceramic material which helps cook food faster and requires less oil to cook food making dishes healthier for the family. 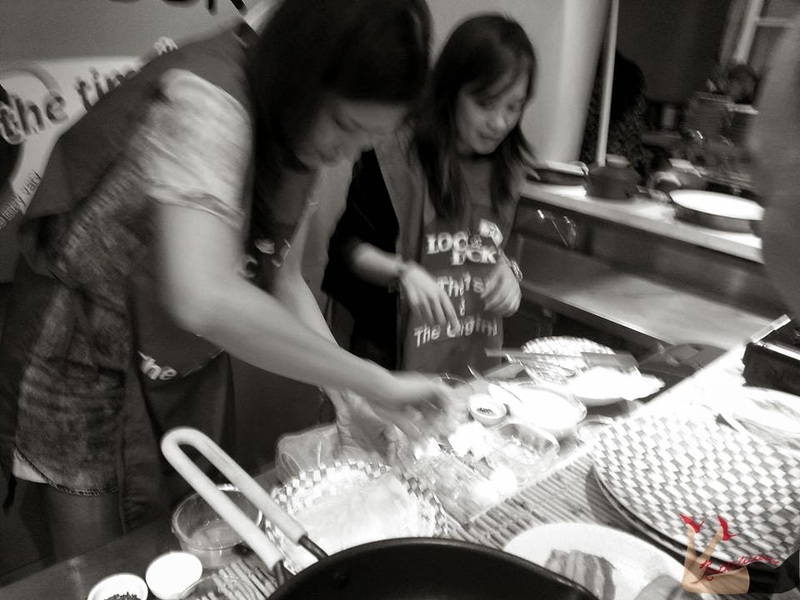 For us to better appreciate the new products, a cooking demo was conducted by Chef Kalel Chan. He is a Corporate Chef of the Raintree Restaurant Group who earned a degree of BHRM in DLSU-College of St. Benilde. He introduced innovative concepts to restaurants such as Chelsea Grand Café, Momo, Mr Jones, Stella, Rocketroom Saboten, Kabila, Simple Lang and M Café. Chef Kalel used the new CookPlus Line and Lock & Lock Glass Line. We have witnessed how the new CookPlus helps in cooking food faster with less oil needed. The food looked lovely, yes? They sure tasted good. It is always a treat to dine in M Café. After the picture above, the next picture taken in my iPad was this.. TENEN!! We were picked to do the Cooking Challenge! I was seriously praying not to be picked, but Law of Attraction worked reversely this time. We needed to cook a pancake, 2 eggs and all 4 bacon strips. We were judged based on speed, presentation and taste. When I beat the egg for the pancake mix, I didn't need to worry about breaking the glass as it is thick. There is no worry that the glass might chip or break. I only added a little oil to cook the pancake. At home, we actually no longer use oil to cook pancake in a non-stick pan. But coachers and distractors said so, so I did :) It surprisingly cooked my pancake well and good. When I flipped the pancake and it went to the side, it was also cooked evenly because Lock & Lock CookPlus evenly distribute the heat. I cooked the sunny side-up without oil and it didn't stick in the pan. The verdict? I won! Yay! My momma and my college friends and professors would be proud of me! Haha. 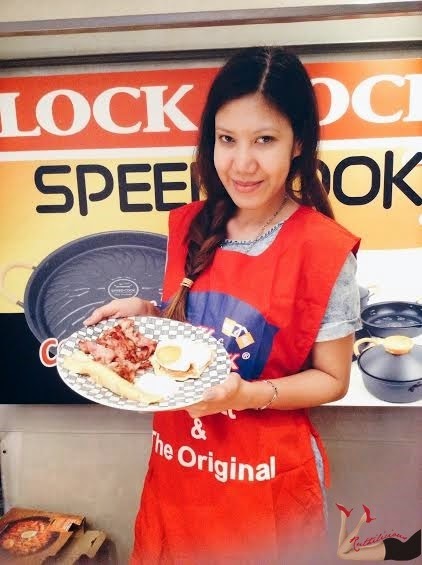 Thank you Lock & Lock for making me experience cooking with the new Lock & Lock Glass Line and CookPlus! I am wholeheartedly welcoming these new lines in our humble kitchen! What I was wearing under the apron? Are you a Lock & Lock loyal too? What do you think of the new product lines?